Dedicated servers are the best choice for larger high traffic websites that attract millions of visitors daily. Dedicated servers are servers which are dedicated for one website only – that is, they only contain the data of a single site. It is the option for larger more powerful sites that want customized server settings and optimal performance. Larger sites will carry heavy audio, visual and text files and attract thousands, if not millions of visitors, each day. For most large sites, 250 GB, 2,500 GB bandwidth and 2 GB RAM is sufficient for the site to run effectively. We stress that RAM is an important feature for the server to run effectively. Further, webmaster should also look for the ability to upgrade the server specifications in terms of RAM, storage space and bandwidth. Dedicated plans will also offer different processor types for the servers. The more common and affordable plans will offer hosting on Intel Celeron D, AMD Athlon 64 and Pentium 4 processors whilst the more expensive plans will offer dedicated hosting on Intel Dual Xeon (generally 3.2) processors. Most people have their own preference and opinion and we will leave that choice up to you. The Web Hosting provider must utilize top class software and hardware for operation of its server and guarantee their physical safety. Appropriate back up and contingency measures have to be in place. Technical support is also crucial as big problems (which equal big money) need to be resolved competently and swiftly, and at any time of the day or night. Web Hosting Buzz offers the most competitive dedicated servers. They offer multiple plans using Single Processor Servers (Intel Xeon E3 Series and Quad Core CPUs) and Dual Processor Servers (Intel Xeon E5 Series and Quad & Hex Core CPUs). The plans range from $119 a month to most expensive at $459 a month. The cheapest plan of $119 runs on an Intel Xeon E3-1240 v3 processor and provides 2 x 1TB (HDD) storage, 40 TB bandwidth and 8 GB of RAM. The most expensive plan, $459 a month, runs on Dual Intel Xeon E5-2620 v2processor and offers 4 x 240GB (h/w RAID 10) (SSD) storage, 40 TB bandwidth and 64 GB of RAM. All Web Hosting Buzz dedicated server plans come with same day server setup, 24x7x365 support, cPanel and WHM control panels, and 100% network uptime. We would be remiss if we did not talk about Arvixe Hosting dedicated server plans. 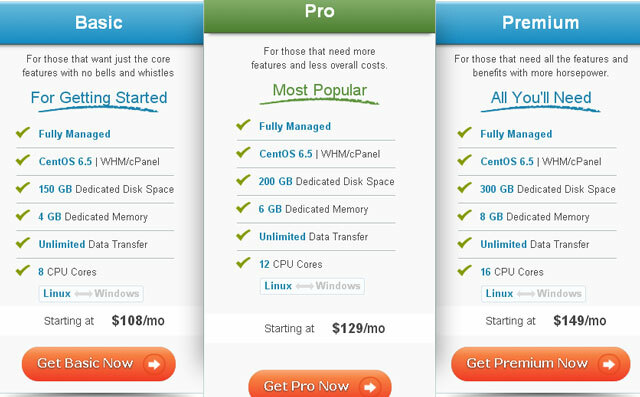 They offer cloud technology based servers as well as multi processor servers. Their cloud based dedicated server plans begin from $108 a month and go up to $149 a month whereas multi processor server plans range from $429 a month to $719 a month. All of their plans are fully managed and you don’t have to worry about a single thing about your server. However, note that features and specs of each plan are subject to change over time. So, we will be keeping an eye on them to see if there are any changes. We recommend checking back with us every now and then.